If you are a fan of vintage British motorcycles and you are filthy rich, here's an auction you don't want to miss. The last Brough Superior SS100 ever produced will be up for sale at the Auction of Exceptional Motorcars and Motorcycles in Carmel, California on Thursday. Then again, most of you have probably never heard of this bike. I'm a fanatic for motorcycles, particularly classics, and I had to brush up on this one myself. The last Brough motorcycle is expected to fetch a price of $350,000 to $400,000. Approximately 3,000 Brough motorcycles were produced in their 21 years of production. Approximately 1000 still exist. However, it is believed that only seventy-one of the SS100 models are still around. "In 1924 it was the world speed record holder at 124mph. It was untouchable," commented Dave Roach, from the National Motorcycle Museum. Each SS100 was certified to reach 100mph — astonishing for that era. According to Roach: "It's a very important motorbike, it was classed as the Rolls Royce of British motorcycles in its heyday." 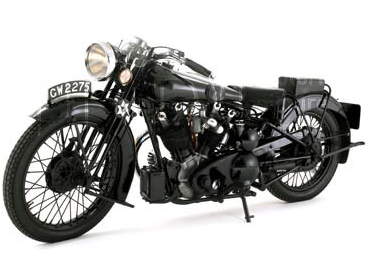 Here's another tidbit for you: TE Lawrence, aka Lawrence of Arabia, the British army officer famous for his role in the Arab Revolt during the World War I, owned seven of these bikes, and was killed riding a Brough Superior SS100 in 1935. In the film, which took home 35 Academy Awards, the role of Lawrence was played by Peter O'Toole. Bonus points for you motorcycle/film buffs who can tell me what bike old Lawrence crashed on in the film. I'll give you a hint — it was a ridiculously fast bike for its pre-WW2 era, but it wasn't British, and it certainly wasn't a Brough. In fact, the were produced right here in California — Los Angeles to be precise. Got your guess? The answer is below. The bike in the film was a Crocker, if my old memory serves me correctly. I'll do a little research and figure out exactly which model, for those of you with a penchant for detail.